Today, I took my daily putter, three canine companions in tow. The two that I've got until their owners get in contact with me haven't learned the fine art of stepping around plants yet, but we'll forgive them for the time being. 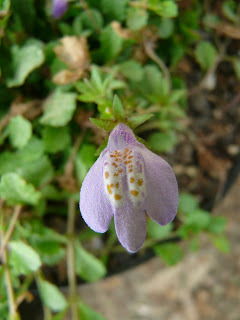 One thing that's in bloom that caught my eye is a lovely little groundcover called Mazus reptans. The little three-fingered flowers are smaller than a dime, and oooh, so charming. We'll see how it does where it is currently; I think it's a bit too sunny for it. How does one teach a dog to not step on plants? We're looking at getting a dog now, and its been a very long time since I had one in my life I'm not sure how I'm going to teach him what's acceptable in our house. I also put stakes and obstacles in her frequented short cuts through the beds, and she caught on pretty quickly to follow the stepping stones or stay outside the bed. Now, the only time she does it is when she's angry and trying to make a point -- but she's unusually spiteful for a dog.